Looking how to get cheaper diapers? When you start adding up how much diapers cost over the course of a few months, and then a few years it gets expensive. Multiply that by more than one baby, and you looking at thousands of dollars! One thing is for sure, there are always ways to get cheaper diapers. Use these simple tips to save money on a new baby and make sure you’re getting the most bang for your diaper buck. When trying to figure out which diapers to buy, check each packages cost per diaper. You’ll be surprised how widely this can change between brands and even “types” of diapers. For example, I buy a particular package of Huggies online. I currently always pay between 14 and 19 cents per diaper for a size 4. 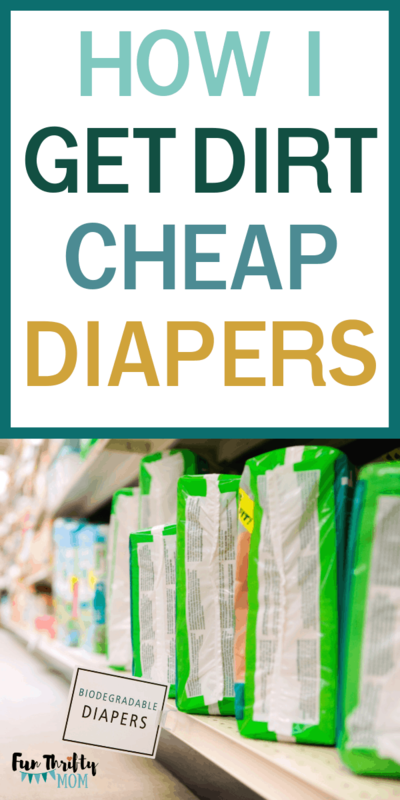 If a store is having what seems to be a good sale, I compare the price per diaper to see if it’s worth it. Buying online nearly always is a win for me, but every once in a while I’ll come across a better deal. 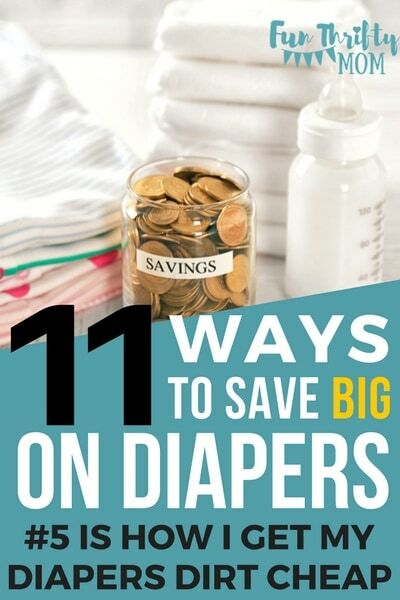 The larger the pack of diapers, the less per diaper you will typically spend. Again, always check your cost per diaper, but overall its usually a safe bet. Some people swear by diaper sales at Costco and Sam’s Club so if you are a member check those out too. The few times I went to Sam’s Club though, I wasn’t all that impressed with their diaper selection. All major brands of diapers have coupons nearly all the time. 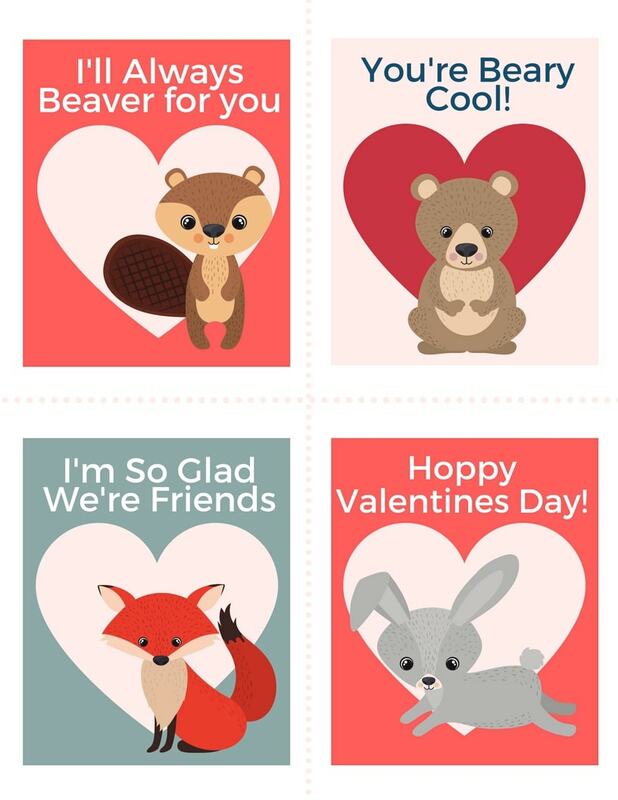 I always find digital and cut out coupons for $2 off on Pampers & Huggies. Sometimes you can even find better coupons for $5 off. If you are brand specific make sure to reach out to them and request coupons frequently. Don’t ride off store brand diapers. I loved the target brand diapers and they were much cheaper than the big name brand ones. They were so stinkin cute with little blue whales all over the bum! I liked them because the material was biodegradable too. Meaning they will actually decompose after a while. And they were cheaper! I will say that the material they were made out of was more of a paper feel, and they leaked more than the other brands. But the only time this was an issue was overnight. So I just used my super cute, much cheaper diapers during the day, and then one overnight diaper at night. Amazon has the best prices on diapers I have ever found on a regular basis (with the exception a couple really great sales at Target.) For example at the time of this post, you can get these Huggies, size 3 diapers for 12 cents a piece! If you have Amazon Prime you automatically have Amazon Mom. If you subscribe you’d get up to a 20% discount on top of that price. You can always choose the subscribe option and cancel it if you change your mind. Now, these are “cheaper quality” Huggies. They are not the same as the super soft and fluffy, stripe that turns blue when wet Huggies, but they still work great for my kiddos. If you end up getting the Huggies from Amazon, you can upload your receipt on the Huggies Rewards Page. 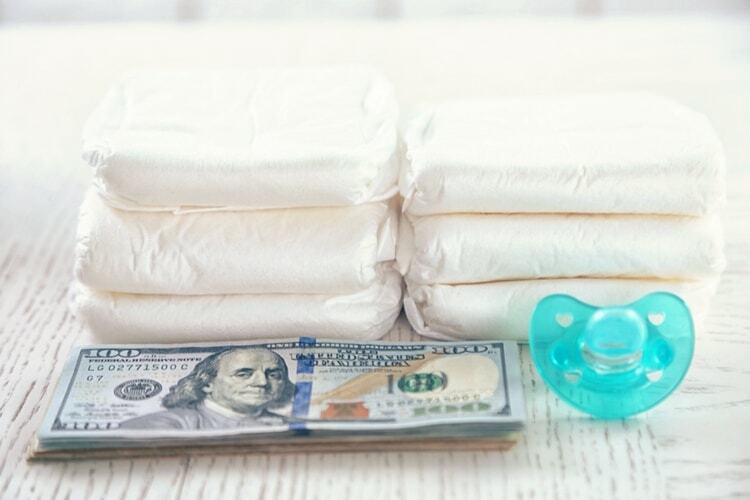 You’ll get a few hundred “Huggies Points” for every big box of diapers you buy. When you save up enough points you can get free diapers. If you’re pregnant, think about hosting a diaper & beer party. These are like a dad’s version of a fun baby shower, but it certainly doesn’t have to be just for men. It’s a good idea to host a party like this instead of a baby shower if you already had a baby and have most of the baby items you already need. If you’re trying to build a diaper stock, make sure not to stock up on too many smaller sizes like newborns or size ones. My babies fit into newborn sizes for all of one week. 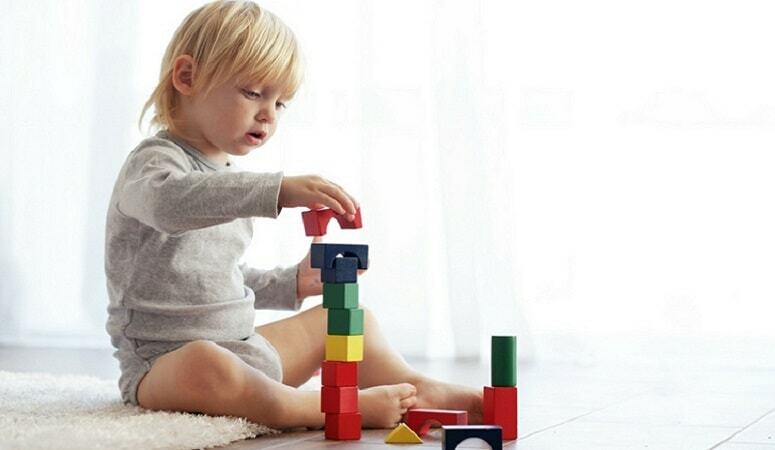 Usually, babies tend to stay in size 2 and 3 the longest. So those are good sizes to stock up on. Personally, I like the subscription option from Amazon and prefer not to stay fully stocked. Those boxes are big and just take up too much valuable storage space in our tiny home. Cloth diapers can save you hundreds, if not thousands if used for multiple babies. In our house, we use a combo of cloth and disposable. We use cloth diapers when we are at home and hanging around the house, and we use disposables at night or when going out. It works for us. If you decide you want to cloth diaper full time, it’s totally doable, just takes a bit more planning. When trying to figure out the best cloth diapers for us, I bought two different brands to start with to see what all the fuss was. I bought one bum genius diaper (It was $20) and a 6 pack of these very affordable cloth diapers for $36 (So, $6 each). I absolutely loved the cheaper ones and hated the bum genius one. Now, I say this, but they are two very different types of diapers. The bum genius was an all-in-one and the cheaper ones where “insert” diapers. This all sounded very foreign to me until I actually started using them. But the insert ones are so much easier to clean and dry and sanitize in my opinion. They are just as easy as the all in ones too in my opinion. The all in one kept leaking, and I stopped using it before I could figure out why. I bought 3 six packs and one extra set of inserts. (I double the inserts when my babies get bigger to prevent leaks.) My cloth diaper stash cost $140. I’ve heard of people spending much more on their sets. Honestly, if I were starting over I’d pick up 2 more packs just due to having two babies in diapers I find myself washing diapers every day and a half, and another pack could push it to two. If you are using cloth diapers, you could consider cloth wipes as well. Lots of moms use the dry storage method, which means you basically keep a pile of cloth wipes with a spray bottle of solution. I like the idea of just water and coconut oil mixed together, as soap can be harsh on new baby skin. You could also make your wipes with this DIY recipe. It’s way cheaper than buying wipes. This is so much easier before they start crawling. You could always let your baby “air out” for a large portion of the day. When they are just hanging out after a diaper change you can fold a towel and let them hang out there. When they pee just change out the towel. This helps prevent rashing up too. Of course, this isn’t convenient when yall are moving around but can help reduce the number of diapers your using.